Our CONGRATULATIONS and THANK YOU to Miranda Creel, Senior Vice President at PNC Bank in Cleveland, Ohio. Miranda demonstrates power, personality, and perseverance. Her training, work quality and discipline has enabled her to successfully climb and maintained a high position on the corporate ladder, while overcoming numerous challenges. In spite of those challenges, along with day to day professional demands, Miranda always shares a warm smile and greeting to those she meets. In January 2017 she participated at the Mt. Zion Freedom Conference where she is repeat presenter. 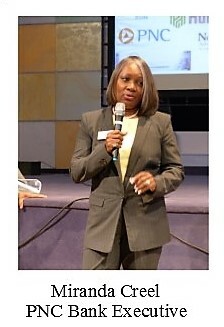 I witnessed her informative and inspiring presentation during a prior year's conference at the church. She is truly a dynamic presenter and person, always willing to give back. Miranda is a member of Mt. Zion of Oakwood Village, where Rev. Dr. Larry L. Macon, Sr. is the Pastor.